Couldn't agree more. This hack is phenomenal, it's so much fun to play. Keep up the brilliant work !!! Yo Pi, I need that battle theme of the Eldigan fight. Even better are you planning to release the full remixed ost at some point? I cant play the game for some reason. Its telling me its not a valid game file. .___. .ups files aren't the game proper. You need to patch an FE7 rom with the patch. There's a patching tutorial in the resources subforum. DON'T ASK US WHERE TO GET THE ROM. FIND IT YOURSELF. Oh alright. Where it this "subforum", I havent been here in a long while. Because if there's more information to help me out, i'd most likely need it. Should be ez to find around the internet..
its a GBA game after all. Was Pi ever able to keep Arenas from killing your guys if they lose a battle, or does it still work like normal Arenas? According to MK404's playthrough, no he hasn't. Hopefully you're all still doing well. Count me among the chorus of voices cheering you on - keep on keepin' on, and if you have to take a break to avoid burn-out, don't hesitate. Browser lagged out; forgive the accidental double post. Since it's April 2nd, it's time for another biannual update! Unfortunately, my real life duties are still keeping me occupied for a little bit longer, so there isn't an official April update this year. Perhaps the lack of update... is the real April's Fool update. On a more serious note, I do expect to start working on this again in the summer, so if I get enough progress by then, I'll have a summer update to make up for this missing update. I've penned down a lot of fun things to implement on my to-do list and my hacking fingers are itching to get working again. Thanks for reading and keeping up with the project! Thanks for the feedback, and I'm glad you enjoyed everything so far! Right now the plan for animations is to make them myself, depending on the progress as 0.2.0 gets done I'll use some pre-made ones. Despite the lack of progress the last two years I am still planning on finishing this up. Just finished what's done so far of this hack, here's my thoughts on it. Starting with the gameplay changes from the original game...I have some issues. First off, the map size. 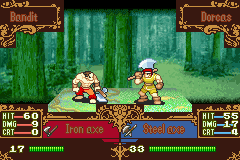 Now, I understand it would be immensely hard to put FE4's gigantic maps into a hack of FE7. But, splitting the chapters like this is irksome to me, mostly for story reasons. The giant maps in the original, at least in my opinion, help world build, (Geography for example) and give the conflicts and battles more scale and depth. In some other cases, splitting them feels sort of awkward; like in the Prologue, fighting Dimaggio and Gerrard, then Gandolf in the next chapter takes some umph out of the fight. To sumerize, I understand why it had to be done, but I'm iffy nonetheless. As for a collective gold supply...it feels weird when applied. 4 is built around choosing who to fight who so they will get the item drop or gold, to the point where theives actually have a purpose other then looting. Making it collective takes that whole layer out. To a lesser extent, this applies to the edition of trading as well. To add a nitpick, the removal of gradual village destruction is annoying. And for a really minor thing, I miss the whole castle guard mechanic. There's also the portraits, which I find a mixed bag. Some are great like Alec and Noish, and some just flat out don't work, like Aideen and Kurth. The main issue I have with them is the shading and modelling is all over the place. 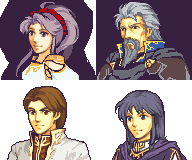 Some portraits are done in the style of the typical GBA mugs, then others are done in this weird muted gold. A few even clip through, such as Byron. All of them share the distinction of being full body shots, which sometimes clashes with backgrounds. The actual hacking itself is done pretty dang well on the technical side. Kudos to the remixes and custom sprites in particular. Overall, I give this hack a 7/10. For the large maps, I want to emphasize that hacking in the original maps is not a big concern; the choice of dissecting the original chapters into smaller chapters is intentional and not due to hacking limitations. There are a lot of reasons for this, the most important one is allowing me to create non-outdoors chapters. One major limitation of the original FE4 game is the lack of indoors chapters due to several game mechanic choices (several missions on a single map, castle guarding, etc.) This also creates some limitations with designing some interesting gameplay; for example Chapter 3-1 is challenging to set up in a giant chapter setting. One other major issue that bothers me with the giant chapter structure is that they don't necessarily end at the right places. My hack ends in the middle of Chapter 3 because the battle with Shagall is the right capstone for the arc. The section in the original game after beating Shagall is more suitable as the start of the next arc, but it wouldn't be possible to pair it with Chapter 4 since it takes place on a different map. 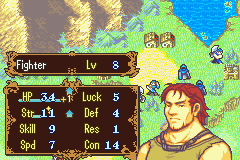 Regarding individually managed gold, it makes more sense in a setting where each unit can reliably get gold (in FE4 this is village rescuing and the communal arena), but the problem with the arena is that you have no penalty for fighting in the arena so you're required to do a lot of legwork with no risks involved. I'm personally not convinced the system adds interesting depth to justify implementing it. Villages are also similar since you can usually wait to visit it with the desired unit. This is also why partial village destruction is gone, since its main purpose was to help individual gold reserves. The castle guard mechanic only makes sense in a giant map setting, and even in that case it mostly serves as a "Gotcha" to the player since castle capture attempts in FE4 are predictable. The fact that FE4 has a designated castle guard isn't making it any more interesting either. It's not hard to design similar types of objectives (Chapter 3-1 is close in that regard) so it's possible to recreate the interesting parts. Hopefully the explanations above will clarify to anyone else why I've decided to omit certain features from the original FE4. I'm glad you're enjoying this project despite these changes! The portraits are in various states of completion so there's not much to be said there; until they get done you'll have to get used to them! Glad to hear you both enjoyed it! I hope you'll still be around whenever the next update is released. It shouldn't be too much of an issue to make the music so it'll happen eventually. I am slightly surprised people have found Eltoshan's battle theme though, since I only gave it to him (the Cross Knights are also supposed to have it.) It's still a work in progress but I plan to upload a video of it to the project channel in the future. It's active in the sense that I'm still working on it, although not as frequently as I'd like. I also don't check in very often, the only reliable times you'll see any updates are during April and October, so tune in around then! In the current release units will die in the arena, but the next bugfix release will have non-lethal arenas. For some reason I can't download the patch from Mediafire, could anyone mirror it elsewhere? Hello everyone, it's the end of summer and time for a small update! This year has been keeping me occupied with a large number of projects so I have been light on the technical side. Instead, I've been working mainly on writing (working out the timeline for Chapter 4-x), balance (tweaking experience formulas and some more subtle issues), and graphics. There has been a lot of graphics work and I'd like to show some of them off, but I'll be saving them for the Halloween update as they are tied to more important changes. Today I'll be showing off some of the less important changes. Finally, the last two portraits are older versions of Oifaye and Shanan. If you watched the last halloween video, the portraits used in there are based off this version, and they'll be appearing in the 4-x chapters. Obviously, it's still a work in progress and the designs will likely change a bit, but it should give you a good idea of the art direction for future UI updates. (The non-white text in the battle frames is a side effect from testing.) Unlike the portraits, these *will* be polished up in time for the next release. This is the combination of two chapters from the Silesia section; the midpoint is about where the maps would be divided. Thanks for reading, and look forward to the next update which will cover some bigger gameplay changes! I've added a Dropbox mirror below the Mediafire download link, give that a try. Ah sweet, an update! I love this hack so much, I can't wait for the next update! All of these look so amazing! Looking good, UI, as well! Always appreciated to see your more stylistic art choices at work, Pi. I almost forgot about this hack. It's been like two years when I played an older version of it. The the new stuff, chapter 4 and Taillte look really nice. Kinda unfortunate that I can't play the newest update right now because of technical issues. When I have a new PC, this hack will definitely have high priority in my to-do-list. Location: Where else would I be? I don't really use this account, nor did I really ever in any meaningful way, but I'm still head-over-heels for this Hack and am ecstatic to see updates on it. Seriously, I pretty much only ever visit the forums to check on if any news has sprung up here, and it's nice to be pleasantly surprised!